« WHERE DID THIS COME FROM? Our contemporary life styles too often demand of us the kind of decision-making that results in quick and deliberate action. And this seems to be ongoing with little space for just being. It seems like every situation demands that we take an action … NOW! When in doubt do something! Any action is better than nothing. But is it? Lately I have been thinking about how not doing, being still, can also be powerful in effecting outcomes in the world. A few weeks ago I had attended a taijiquan[i] training retreat with my master Alex Dong (www.alexdongtaiji.com). Through out the workshop he demonstrated ways in how stillness can be applied to defeating an opponent. That is, by refraining from lapsing into a default reactive stance towards an attack we can marshal other inner resources to ward off an attack without loosing our balance. The insight from my taijiquan training reminded me of an experience that happened when I was spending some time in Pokhara, Nepal. I had just completed a 33-day trek in the Himalaya. 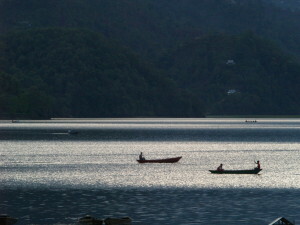 Afterwards I chose to hang out with my trekking buddy on the shores of Pokhara Lake just out of town. This is a very busy, though low-key place for tourists and trekkers to meet up and chill. One day my friend and I rented a boat and spent the afternoon floating about the lake with the back drop of the Annapurna range looming off in the distance. Perhaps because of my recent trek I was particularly relaxed and at peace with myself. I was able to tap into an extraordinary place of calm and stillness. My friend equally shared this state. We had spent over three weeks walking together, for the most part in silence. Thus we were well practiced in being in such meditative states together. To this very day I am profoundly grateful for having had the chance to relate with another human being in this manner over an extended period of time. As evening approached we decided to return to shore and go get dinner. As we approached a small temple shrine that extended out into the water this ‘armada’ of boats appeared. They were all paddling out to intercept us. It became apparent that they had all kinds of wares and they wanted to sell them to us. Under most circumstances this would have annoyed me since the last thing I wished to do was engage in all kinds of haggling and bargaining. The prospect of altering the sense of peace we had achieved was not inviting. However, the depth of the stillness we connected to in ourselves was powerful. The alignment was strong and at the same time required no effort to sustain. So there we were in our boat, both of us staring straight ahead gently but firmly paddling almost oblivious to this encroachment. 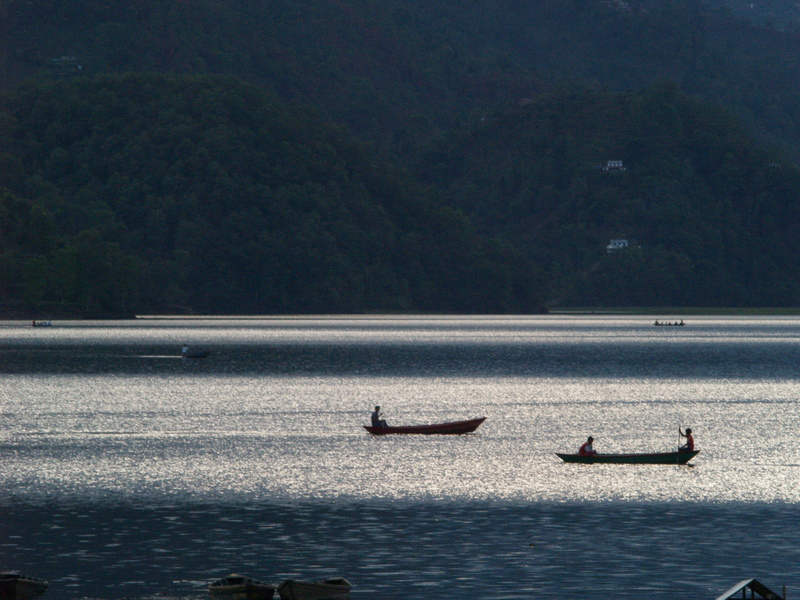 As the hawkers gathered around us, all clamoring for our attention, we continued to paddle in silence straight ahead. Then something miraculous happened. All these men in their surrounding skiffs and boats quieted down. They too became very still. They dropped their agenda of selling and entrained themselves to the mood we were in. The sense of it was palpable. It was as if by coming into the orb of the atmosphere around us they became absorbed in the same experience of peace. The market place receded and we were all now devoted to the extension of this stillness. We had created quite the spectacle. People began to line up along the shoreline to witness the passage of our meditating flotilla. For a moment there was this appreciation of how, by not reacting in my default ways, another possibility could enter. By not engaging a preferred way to deal with disturbances we can allow ourselves to be moved by a mysterious force; a force that could be more inclusive of diversity or difference. Such a force can even transform situations. I was noticing at the time how I was open to allowing everything to be a part of what I was experiencing and letting the stillness that I was anchored in to organize the field around me. So the stillness in my taijiquan practice and the Pokhara Lake incident reminded me of the power of how such quiet can impact the world around me. The more profoundly I connect to what is inside the more I am also connected to what is outside. They are related. [i] Taijiquan – Often spelled Tai Chi Chuan and referred to as Tai Chi for short. This is a martial art that is primarily practiced in slow motion. Taijiquan was first developed by Chang San-feng during the Song dynasty (A.D. 960-1278). Thank you, Jeff, for this post. It’s very beautiful and so truthful. It’s a great experience. Thank you for sharing! I saw everything you wrote about in my mind as I read your words. What a wonderful memory and experience.Great writing! Always look forward to reading your blog.